The Duncanville Pantherettes came out shooting in their first game of the tournament, defeating Saginaw 82-9. Duncanville, 21-1 for the season, had little trouble defeating the Rough Riders coached by Vance Hughes. Zariella Green scored 14 points in the game followed by Kinley Brown and Asha Ross with 12 each. Duncanville vanquished Killeen Ellison 64-38 in their second contest. All Pantherettes participated in the game. Zariella Green and Aniya Thomas led the scoring with 20 points each. The Plano East Panthers were next on the menu, and fared no better than their predecessors, losing 74-36. Senior Krislyn Marsh led all scorers with 17 points followed by Hanna Gusters and Kinley Brown with 14 points each. For the championship game Duncanville (24-1) took on the Harvard Westlake Wolverines (13-2) from Studio City, California. Harvard Westlake was ranked #4 nationally in MaxPreps. The 45-30 victory over Studio City was a beam that should propel Duncanville to a top slot in the National Ranking for High School Girls Basketball. Wolverines Coach Melissa Hearlihy saw the game slip away when her team scored only 2 points in the second quarter. In the fourth quarter, with a commanding lead, Duncanville Coach Kathy Self Morgan put on a stall and slowed the pace down. Coach Self Morgan said, “Good shooting and a strong offense were important, but defense was the key to victory.” Her philosophy was right on as the Pantherettes earned their five tournament victories under Self Morgan, while no team has scored more than 38 points against them. Duncanville, ranked #5 in the nation this year in MaxPreps computer ranking, has now won a total of 23 times in the history of the tournament. Tournament Director Steve Martin thanked all those who helped make this year’s Sandra Meadows Classic so successful. 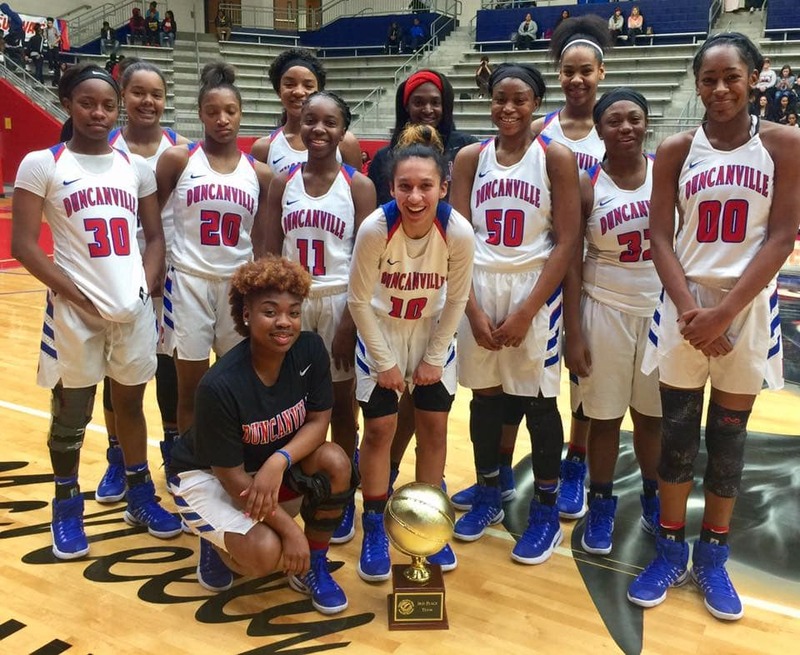 The Duncanville Lions Club partnered with the DISD Athletic Department and the City of Duncanville to help make this one of the elite girls’ varsity basketball tournaments in the nation. Martin, who has served as tournament director for the past 14 years, indicated he’s hard at work on next year’s tournament.